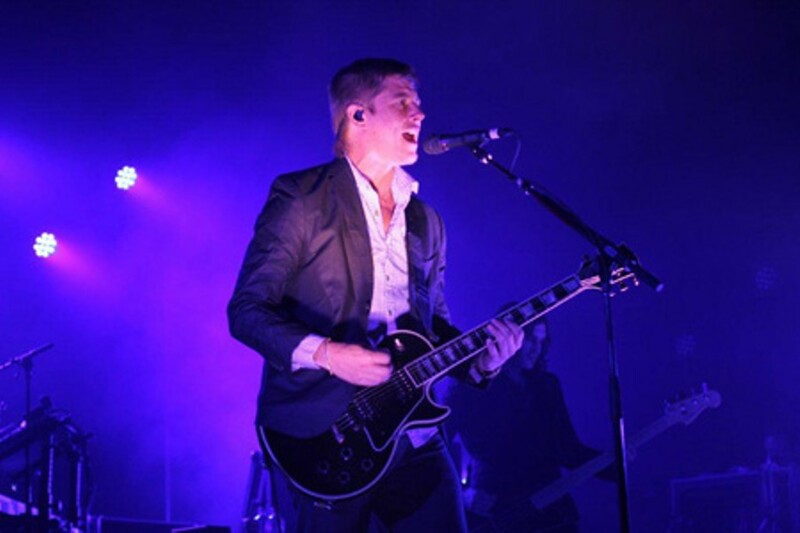 The Interpol faithful turned out in droves for the post-punk band's concert Sunday night. The lads from New York City displayed their dapper sartorial style and worked the crowd into a frenzy, earning the devoted shouts of, "We love you, Paul," directed at singer-guitarist and frontman Paul Banks. Along for the ride was School of Seven Bells, a Brooklyn trio that folded waves of dream-pop guitar into dance beats and electronic soundscapes. The band played about 40 minutes of lovely, disorienting music from its two albums. The audience greeted the first licks of each Interpol song as if it were an old pal—from relatively new tunes such as "Summer Well" and "Lights," on the band's latest album, 2010's Interpol, to the final number, "Obstacle 1," on its now-classic 2002 debut Turn on the Bright Lights. The fans sang along with most of the songs, probably happy to be directing those tortured words toward something other than a pillow. The band sounded great during a set that lasted more than 90 minutes. Almost a decade since rising from the Big Apple nightclub underground, Interpol proved it has developed its own sound, one that feels more original and refreshing than ever. No longer does the band seem to be aping Joy Division, The Cure and the Psychedelic Furs; these days, the group sounds like an equal to those primary influences, interweaving threads of punk, psychedelia, goth and glam. Since Interpol is primarily a guitar band, the best pyrotechnics were of the six-string variety, most often provided by guitarist Daniel Kessler, whose style might be best described as a whiplash combination of warbling rockabilly and sci-fi glitter. "Memory Serves" was a great example, as were the stark, reverb-laden "The Lighthouse" and the Smiths-style bounce of "Slow Hands." Banks, he of the reedy Bowie-esque baritone, also played a few leads, including some mesmerizing EBow work on "Take You on a Cruise." The members of Interpol didn't waste much time on between-song patter; Banks only addressed the audience occasionally, but they engaged the crowd with a relentless attack and dynamic performances, the most engaging of which were probably the headlong rush of "The Heinrich Maneuver" and the delicious lurch of "Rest My Chemistry."